Oak End Farm's Land Rover has a new set of number plates, they were etched in nickel silver by Narrow Planet, they are a more scale like size than the old ones. Also a view of the diesel Lister taken from the door way of the packing shed. 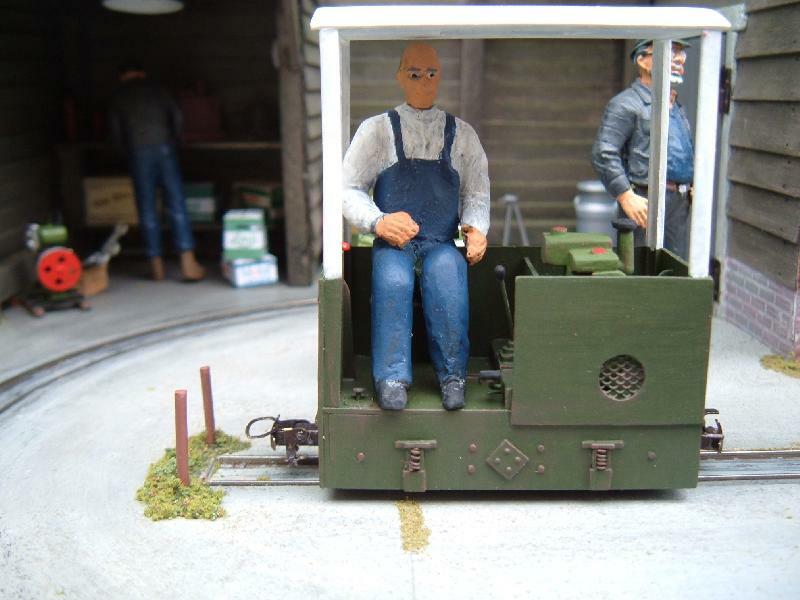 I have started a new loco build for Oak End Farm, it is based very loosely on the Lister Blackstone, operating on the Twyford Waterworks Trust industrial railway. 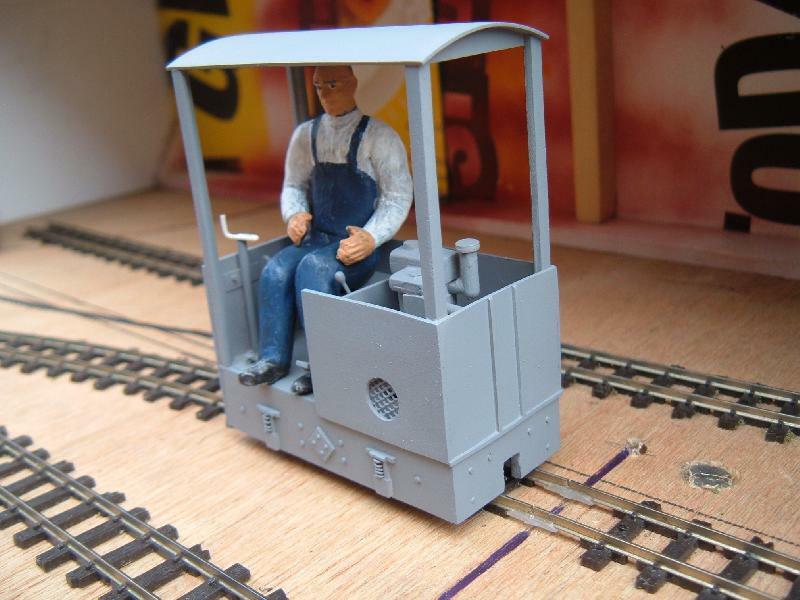 The new loco will use the Kato 11-103 4 wheel tram chassis, and the body will be constructed mainly in plasticard, with brass tube and rod for some details. Strips of lead flashing have been added at this stage, more will probably be added later. 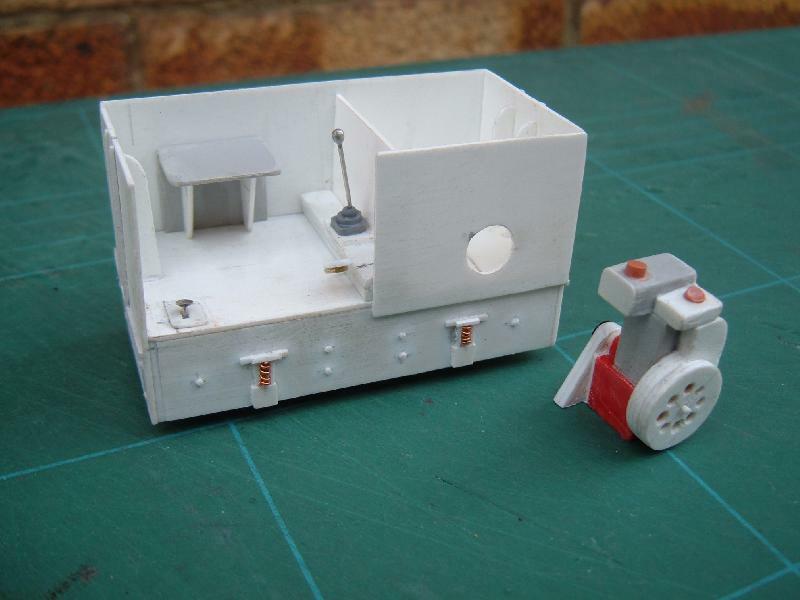 The engine is a simplified representation of a Lister diesel engine, constructed mainly of plasticard with a piece of Lego used in the base, and the gear lever is from a dress making pin. Great job on the motor (and the driver)! 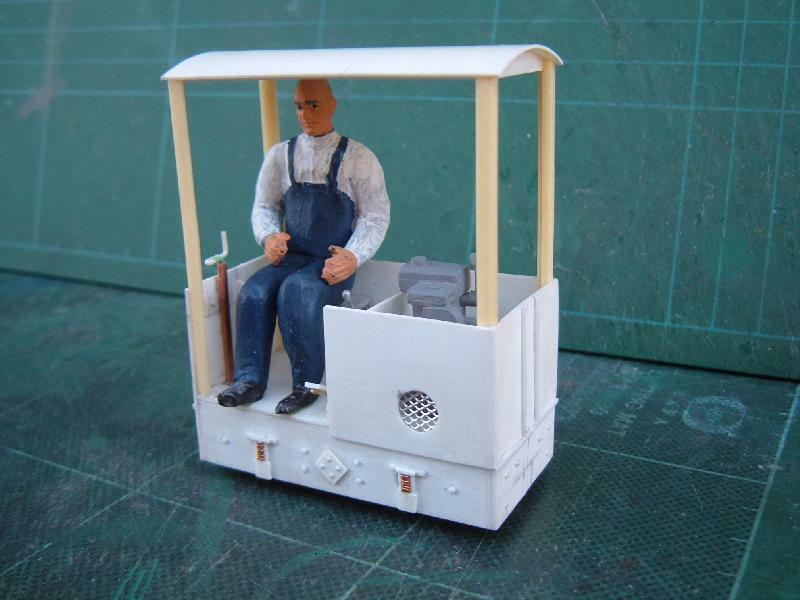 Thanks Glen, the driver is a combination of Tamiya plastic figure, Fimo modelling clay, paper and cardboard. I was quite pleased with the way the engine has turned out, but unfortunately I don't think much of it will be on show once installed in the model. 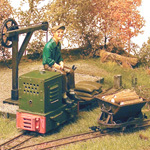 Jack Clarke wrote: I was quite pleased with the way the engine has turned out, but unfortunately I don't think much of it will be on show once installed in the model. I must confess that's exactly what I thought, but I didn't like to say anything. If I had a motor that looked as good as your one, I'd be putting it in an engine bay that had minimal panels around to show it off. (but that's me - too lazy to build anything that doesn't get seen). You could always make another more basic engine that just has details on the top (where you can see them), and save this great motor for your next loco. 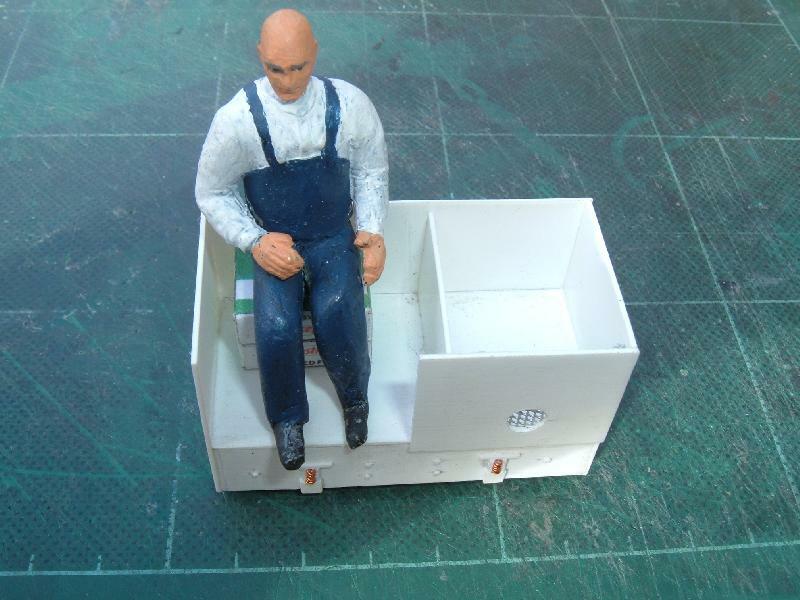 Thank you very much for your kind comments, and yes it will be a bit hidden in the model, but I am not sure how much will be able to be seen so I modelled enough just in case. 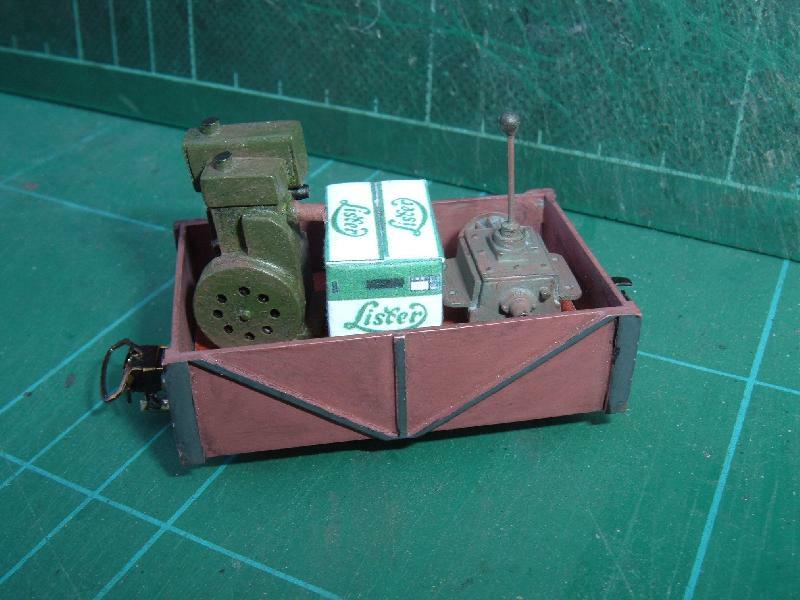 It just so happens that I had enough trial bits left over to make a second engine, to which I have added a gearbox and combined them with a Lister packing case and turned them into a wagon load. 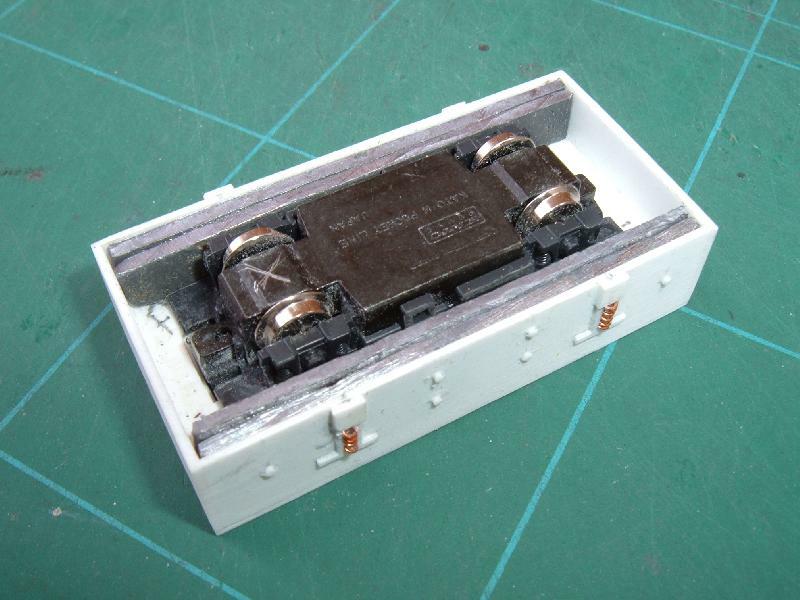 The gearbox is also made from styrene sheet and other styrene sections plus various bits from the scrap box and unused plastic kit parts. I really enjoy modelling little details like this and get a great deal of satisfaction in trying to make something out of odds and ends. Great modelling as usual Jack. The picture really does not do it justice. As always i am looking forward to the next instalment. 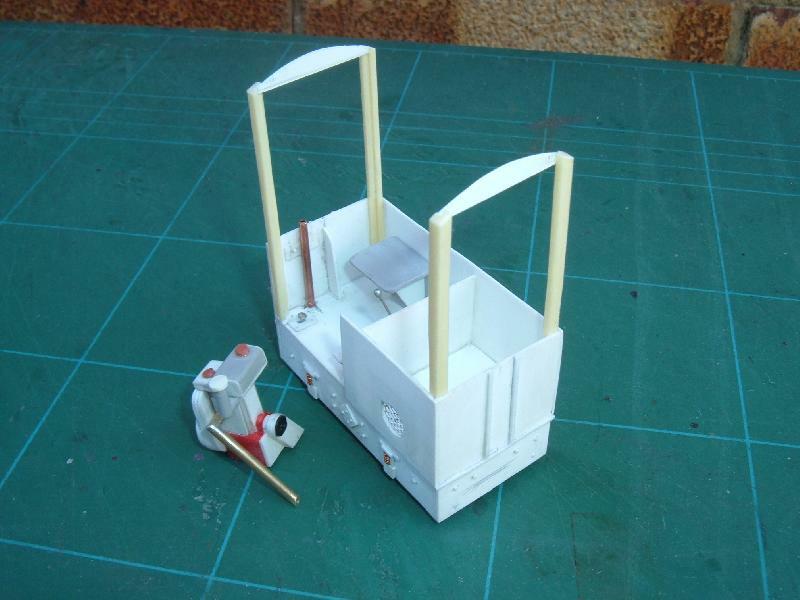 Canopy supports added from angle section styrene with roof support beams from the same material. 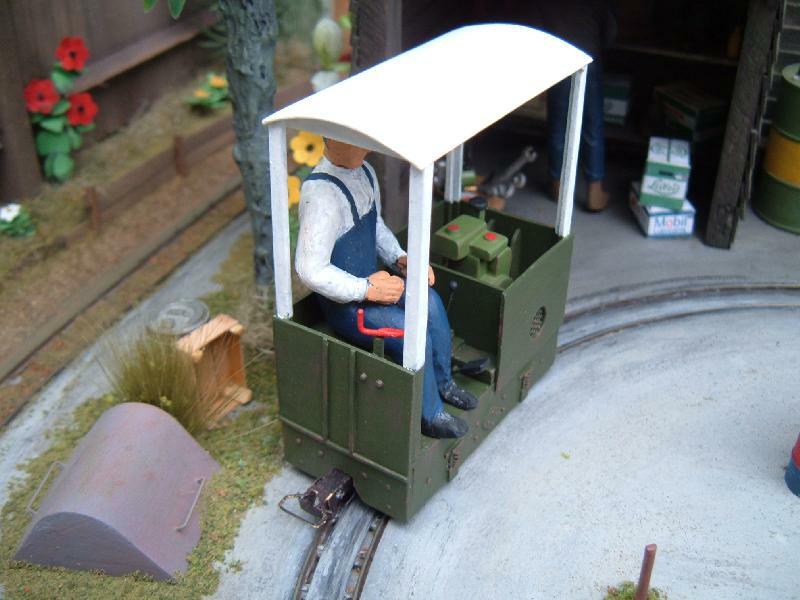 Hand brake tube is a piece of tube from point control wire in tube, engine exhaust is cut, bent and soldered up from brass tube and arranged to exit from the back of the loco. The roof is constructed from styrene sheet and curved by taping to a convenient sized container (beer can? ), filling with hot water for a couple of minutes then draining and filling with cold water to set in position. The engine compartment grille is a piece cut from an item bought from a local hardware shop many years ago, designed to fit on a frying pan to act as a splatter guard when cooking your sausages/bacon etc. Small rivets are formed using a rivet press from behind, the larger ones are short lengths of styrene rod glued into drilled holes. Axle box and horn block detail is built up from odd sections of styrene sheet and strip, springs are coils of soft copper wire, these are placed on the under frame, then touched momentarily with a soldering iron to melt slightly into the plastic. Using this method of fixing the springs ensures more detail is retained, as opposed to gluing which tends to run into the separate coils and fill them up. Looking great Jack, the exposed engine will give anyone looking enough of a taste to want to look closer. The spring construction & assy is noted for the day I run out of Pepper7 sideframes. Thank you Geoff and Gerry for your kind remarks and encouragement. 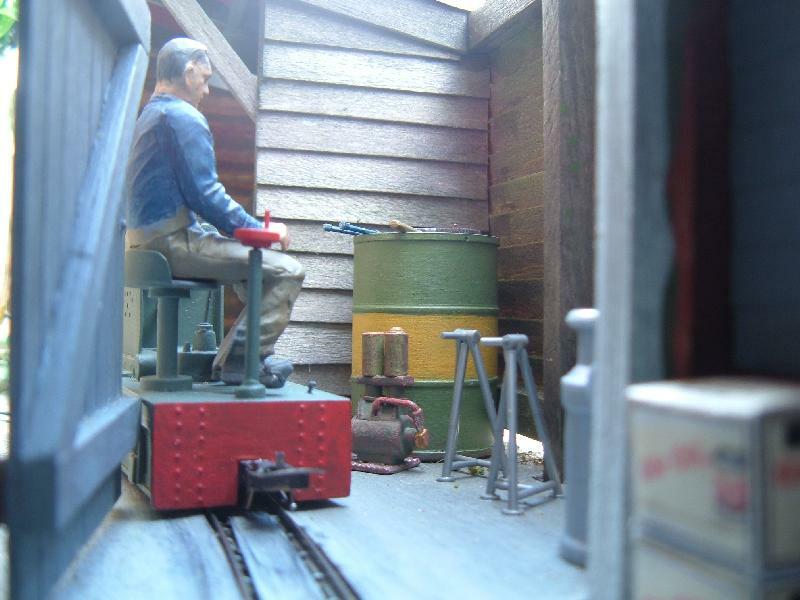 After a coat of primer from a Halfords rattle can, the loco is seen hiding in Oak End fiddle yard awaiting it's top coat. By the looks of it a fair amount of the engine can be seen to encourage closer examination as you pointed out Gerry. Looks really solid in primer as well! Nice work Jack. 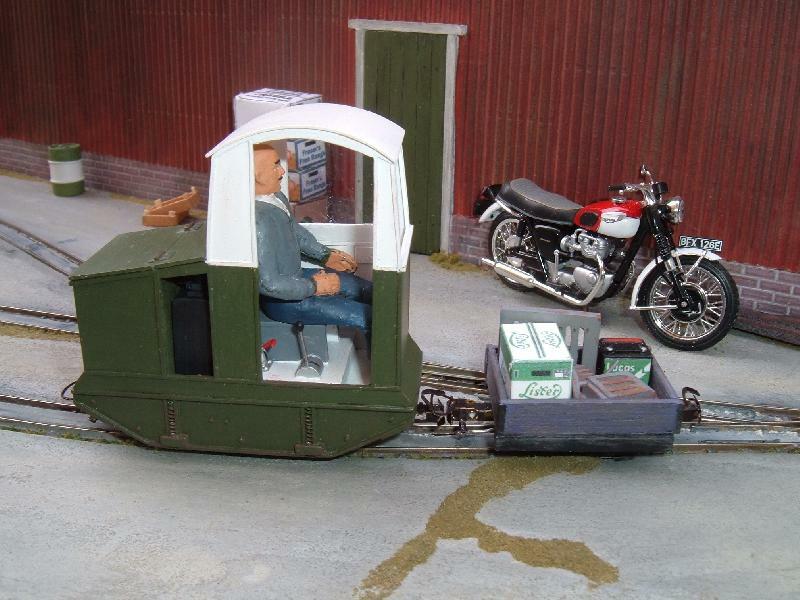 Is the Landrover one of the Haynes' 1:24 diecast models ? The green you have used looks spot on for the vehicle - is this a Humbrol colour ? howard jones wrote: Nice work Jack. 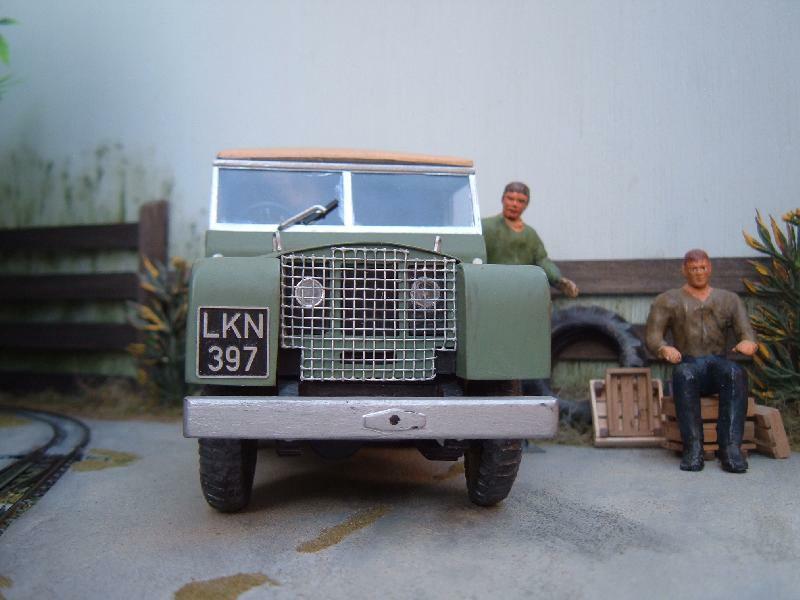 Is the Landrover one of the Haynes' 1:24 diecast models ? Thank you Howard. The Land Rover is completely scratch built from plasticard, wood, brass rod, modelling clay and other bits and pieces from the spares box. I wanted to build a series 1 short wheel base (80 inch) and couldn't find a suitable 1:24th kit, so I thought I would give it a go from scratch. 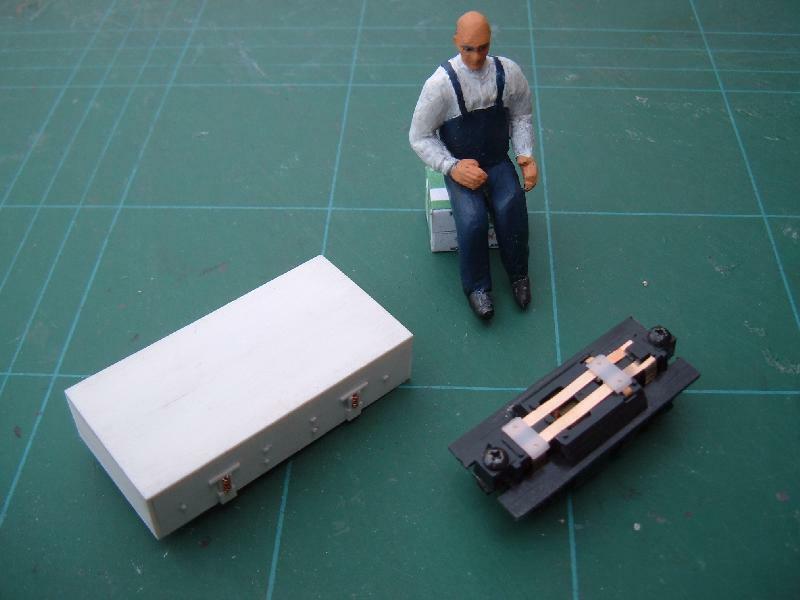 I used the plans for a lightweight Land Rover, kindly supplied by my good friend Ian Roberts, to get the basic measurements and estimated the rest. The paint used is Humbrol matt 78 cockpit green, apparently the early vehicles where painted this colour as that was all that was available after the second war, after brush painting it was given a coat of Humbrol acrylic matt vanish from an aerosol can to get rid of the brush marks. demaine22 and Simon thank you for your kind comments. Thanks for the info. Jack - keep up the good work ! And so to the final painting, the part I enjoy the least! I wanted to finish the loco similar to the layouts other two locos with roofs. I painted the engine unit in a different shade of green to the body and added a touch of red and black in the hope of making it show up a bit more. Paints used are Humbrol and Tamiya acrylics with a spray of acrylic matt varnish from a Humbrol aerosol. if you are coming along. A very enjoyable day at Expong yesterday, due mainly to the hard work of my fellow operators, Roger and Nigel, thanks guys. It was good to chat with Gerry, Steve and Peter Marshall with his Two Sisters Farm, a very nice layout, it was also good to see Chris O'Donoghue with Nottery Quay again. It was a really good day out. It was nice to meet you Jack as well. I thought the farm looked very good. I had a senior moment with the pictures I took of your layout I'm sorry to say. They came out a little blurred and don't do your layout justice so I will not post them. All in all a very enjoyable day, with some impressive layouts on show.